Covercraft is saving a seat for you! Covercraft SeatSaver® Custom Seat Covers offer you great seat protection with slip-on, slip-off convenience. These custom fitted seat covers keep most spills from reaching the seat underneath. 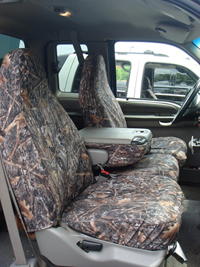 Covercraft SeatSaver® Custom Seat Covers are soft, durable, and – most importantly – washable! 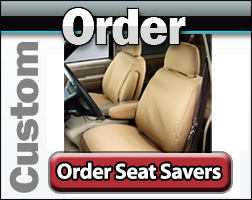 Covercraft SeatSaver® Custom Seat Covers are built for your busy lifestyle! Made of durable polycotton fabric, SeatSavers® can be pulled off and tossed in the washing machine whenever they get dirty. The fabric is treated with a durable water repellent finish to keep most accidents from soaking through to the seats. 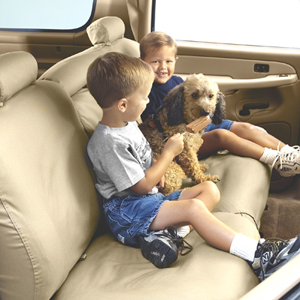 If you have kids or pets, the Covercraft SeatSaver® Custom Seat Covers will protect your vehicle’s seats from all the inevitable spills and stains. These are high traffic seat covers! Covercraft SeatSaver® Custom Seat Covers are made to withstand daily use and frequent pulling off and on. Stress seams are overlapped and double-stitched, just like the seams on a good pair of jeans. Plus, Covercraft SeatSaver® Custom Seat Covers get softer and more comfortable with every wash.
Covercraft SeatSaver® Custom Seat Covers are made of soft, breathable polycotton. They will not give you that sticky feeling like neoprene or vinyl seat covers. In addition to spills and stains, Covercraft SeatSaver® Custom Seat Covers protect your factory seats from harmful UV rays. Protect velour seats from fading and prevent UV degradation of leather seats. Covercraft SeatSaver® Custom Seat Covers are custom-made for your vehicle based on Covercraft’s huge collection of patterns. The seat covers fit snugly for a neat, attractive look. SeatSavers® are available in seven colors. Choose one to complement or contrast with your vehicle’s interior. Covercraft SeatSaver® Custom Seat Covers are available for first, second, and third row seats. Most front seat covers have a handy, built-in map pocket on the back. Keep your vehicle’s interior clean and protected from everyday mishaps with convenient, washable Covercraft SeatSaver® Custom Seat Covers. Colors: Navy Blue, Charcoal Black, Misty Gray, Gray, Wet Sand, Tan, and Taupe. Also available in True Timber camoflauge. Seat Covers ship from the manufacturer via Ground Service Only. Chemical Guys Fabric Guard Protectant 16 oz.